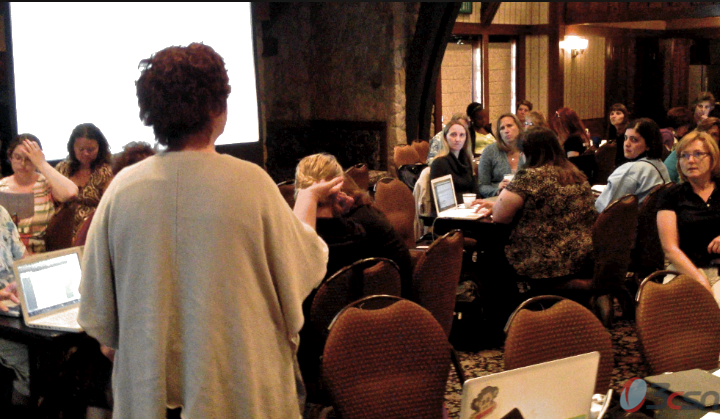 It all began on a Sunday afternoon, with over 40 faculty, administrators and staff converging on the UCLA Lake Arrowhead Conference Center for a taste of 3CSN’s best − BSILI 2012 – Leadership for Curricular and Institutional Transformation. For some, it was straight out of the car and into the Iris Lodge where they were grouped together by table and began the infamous Marshmallow Challenge. Teams were to build the tallest tower, with the marshmallow on top, out of spaghetti, string and a few pieces of tape. As you can see in the video below, the winners were rock solid. After a great BBQ Dinner, attendees returned to the lodge where we began to mull over the concept of the “Power Classroom.” Participants broke off into pairs or small groups and began interviewing each other about what they saw as qualities of the powerful classroom. Approaching 9:00 pm, participants learned that they would need to create a skit about the powerful classroom. There were some cries of dismay about 9:00 pm bedtimes, but everyone pushed ahead and created some amazingly, creative videos about powerful classrooms. One of the crowd favorites, was a simple song, done Adams Family style. Day 1.0, although it really seemed like Day 2.0 because of the amount of work that went in to the Day 0.5, began with a huge upswing of energy as we reviewed the BSILIers first efforts at video production. The videos turned out to be so innovative and inspiring, they ultimately set the stage for the rest of the day. 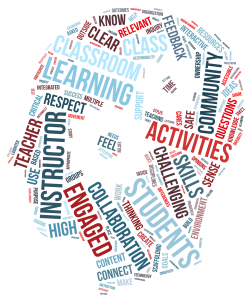 Besides creating videos, BSILIers also wrote down the attributes of a powerful classroom. We took all of those attributes, fed them into the computer and ended up with the picture to the right. The day moved rapidly as we began with a short exercise using the Cohort Tracking Tool. BSILIers looked at their own campus data from the Tool as well as their top-10 Gatekeeper courses and were asked to begin thinking about how this data fit into the narrative supportive of change that they were beginning to create. Becky Rudd, Reading and English Accelerator extraordinaire and BSILI graduate, now turned BSILI presenter, lead us through a narrative of Citrus College’s own Reading and Writing Integration and Realignment. A model example of how a data-driven, faculty -lead, administration-supported, student-voiced proposal can have such a huge impact upon the flow of students through Citrus College’s Reading and English sequences. Becky then had BSILIers poring over Reading and English Course Outlines of Record looking for overlaps and commonalities that could be used to create a compressed sequence of courses for students. That afternoon, Crystal Kiekel, of Pierce College and BSILI graduate now turned facilitator, began the afternoon by taking the BSILIers on journey through Pierce Colleges transformation of their Math program into the award-winning ASAP model. Again demonstrating to everyone how creating a narrative rooted in data and emphasized by a student voice can create a powerful tool for curricular and institutional transformation. Priyadarshini Chaplot, representing the RP Group and Completion by Design, reenforced both Becky and Crystal’s data driven efforts in increasing student completion. After these powerful presentations and activities, BSILIers delved down deeply again into their own college’s pathways, using their college schedules of classes and catalogues. One of the big revelations was it is amazing that any student can make sense out of the complicated resources and tools that we provide them with to “guide” them on their way to transfer, employment, and career goals. At the end of Day 1.0, BSILIers were then given the task of identifying a shared problem that they could began unraveling at their college. 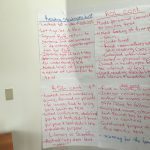 Once agreed upon by the team, they were to create a short presentation identifying a key barrier to student access, success, equity, or completion. This time around there were no complaints about bedtimes or too much work, BSILIers began dialoguing, researching, data-gathering, and creating the beginnings of their narratives. Day 2.0 began with each college team presenting the first draft of their presentation to another team. This enabled teams to not only get early feedback on their work but to also see what other teams were focusing on and see what techniques and tools were catching everyone’s attention. Borrowing from Reading Apprenticeship, we held a gallery walk, where BSILIers could give appreciative inquiry on one anothers’ work. On Day 1, the first BSILI Community of Practice (CoP) on Acceleration was introduced. Day 2’s agenda was devoted to the other two Communities of Practice, Reading Apprenticeship™ and Habit of Mind. The Reading Apprenticeship Project is the second Community of Practice that was established by 3CSN in partnership with WestEd, the organization that took Reading Apprenticeship from a small “district-level” experiment to a nationwide movement and it is a key factor in WestEd’s Strategic Literacy Initiative. 3CSN’s partnership with WestEd is to help spread and increase the number and availability of professional development opportunities for all community college faculty in Reading Apprenticeship. Nika Hogan, 3CSN’s resident Reading Apprenticeship™ goddess, took the participants through an abbreviated introduction to Reading Apprenticeship™. Some of the techniques included Think Aloud, Talking to the Text, and others. 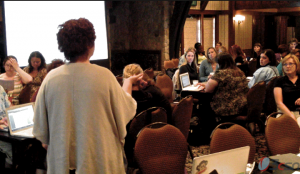 A partnership of expertise between the teacher and students, drawing on what content area teachers know and do as skilled discipline-based readers and on learners’ unique and often underestimated strengths. 3CSN is sponsoring a number of professional development opportunities in Reading Apprenticeship this year. Go to the RAP website to find out more about these opportunities. Our Habits of Mind Community of Practice was introduced this Spring through 3CSN’s LINKS V events that took place in 5 different locations up and down the state. The Habits of Mind breakout sessions during LINKS V were well received and if the number of Jan Connal, Counselor at Cerritos College, spearheaded the effort among 3CSN coordinators (Roza Ekiyam, Donna Cooper, and Lisa Brewster) to create the materials and activities that form the beginnings of this Community of Practice. A habit is an acquired predisposition to respond in particular ways. The habits of mind represent the combination of having the inclination, capability and commitment to particular behaviors that lead to productive outcomes. 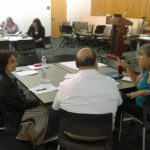 The anticipation of and the embracement of this newest Community of Practice was something we had expected given the response that the breakout sessions on Habits of Mind during the LINKS V events in the Spring. Colleges are anxious to meet the needs of their students and help reduce the huge numbers of students that fail to complete. The wonderful thing about this CoP is that it covers transformations that an individual instructor can make in his/her classroom to overarching, institutional transformations. One of the most exciting parts about this CoP is that we have examples of colleges and programs, like Valencia College in Florida and their LifeMap tool, that have totally changed the tide of student dropout and recidivism in their area. As can be seen in this great TED video and commentary by Derek Sivers, it isn’t the first person who begins dancing that is critical, but rather the second person that begins dancing who validates the first and makes it “OK” for others to join in. Who need to be actively involved? Who needs to be aware of what is happening? Who could stop it (by action or lack thereof)? Where are your dragons? Gaps? With all three Communities of Practice showcased, BSILI participants on Day 3.0 had to make some decisions about with CoPs they would join. 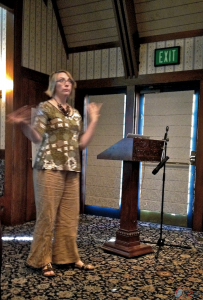 Lisa Brewster gave a great overview if this in the video clip below. To help facilitate the decision-making process, the BSILIers worked on their What Maps. The What Map focused on answering the question, What solution are you going to implement through this community of practice to help close the gap on student persistence, acceleration, and completion. It is hard to believe that only 4 days have passed since our arrival at Lake Arrowhead. Time has ceased to function normally as it would on the campus. The amount of energy, planning, dreaming, networking, and creating has been enough to keep Lake Arrowhead in lights for the next year. Each of the three CoPs, began Day 4.0 by presenting their Logic Models to the rest of the group. One of the major milestones of the CoPs is the October 2012, Strengthening Student Success Conference. Each of the CoPs will be presenting on their Logic Models and progress in fulfilling the outcomes that they defined. Following the Logic Model presentations, Tina Christie and Michael Harner began the final presentation of the Institute on Assessment. Tina began with this great TED talk on evaluation.